A series of musical concerts known as the Night Serenades will offer a variety of musical pieces to the enthusiasts of classical music at Sheraton Hotel in Batumi in August and at Tbilisi State Conservatoire in September. The anniversary festival, held for the 10th time this year, will take place in Batumi on August (26, 28, 29) at Sheraton Batumi. The festival will move to Tbilisi on September 2nd and 4th at Tbilisi State Conservatoire. Around 500 spectators will be able to attend the festival in Batumi. 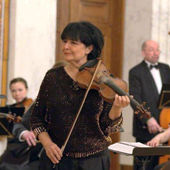 Lead by the famous Georgian violinist and conductor, Liana Isakadze for years the Night Serenades were joined by International Orchestra Virtuosi in 2011 uniting talented musicians from Georgia and abroad. Music by famous composers will be performed by Alexander Korsantia (USA), who is a Georgian international award-winning pianist, Vakhtang Machavariani (Georgia/Belgium) – Georgian composer and conductor, Gia Iashvili – violinist (Georgia/Austria), etc. Due to the high interest over the years towards the festival, it was possible to expand its location, and as of 2015, Tbilisi City Assembly decided to call it "Batumi-Tbilisi International Festival." The International Festival of Classical Music ‘Night Serenades’ was founded in 1982, in Abkhazia. It ceased due to the war. The restoration of the festival became possible only after 18 years, in 2009. The press conference of the festival took place on July 3 at Tbilisi State Conservatoire, where the detailed program was discussed. On August 29, the audience will have a chance to attend “Tango Evening” in Batumi. The festival will feature music by Shostakovich, Mozart, Piazzolla, etc.